Outdoor enjoyment includes a kayak, snorkeling gear, dingy for beach excursions as well as a wide trampoline at the front bow for you to chillax and enjoy a Protected content panoromic view. 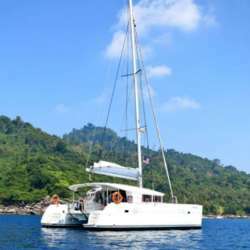 Price includes 5 hours use of yacht, service of captain and boat crew, fuel and utilities. Cruise is to Lazarus Island and includes free use of kayak, snorkel kits, fishing rods, karaoke system and 1 hour yoga session on the beach. Note : Only reservation with payment is considered confirmed.